Cobblestones is an exquisite stone built thatched 17th century cottage rightly listed Grade II. It is a former agricultural workers cottage and has an inglenook fireplace and many exposed beams. There are generous gardens backing onto farmland with a brick out building and more farmers gardens to the front with a hand gate and path to the front door. To the side of the next door property is an area of converted hard standing for vehicles and a lovely lawned area sheltered by hedgerow which leads in to an area of wild garden. In all approximately a quarter of an acre. 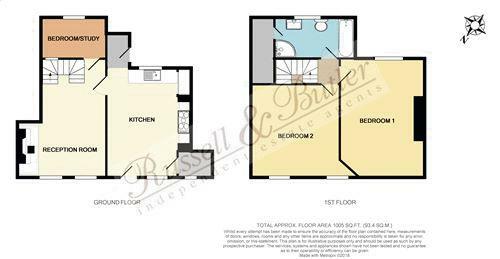 Accommodation briefly comprises reception room, kitchen/diner, study, two bedrooms, family bathroom, brick out building, rear gardens, lawned front gardens, car parking area. A handgate and pathway lead to the front door, ledged and braced. Entrance lobby with utility cupboard housing LPG fired boiler serving domestic hot water and radiator central heating, plumbing for washing machine, walk in area with Oriel window, tiled floor. Bespoke handmade units including a dresser unit, built in shelved cupboards, range of wall ad floor units with marble work surfaces over, incorporating 1 1/2 bowl sink unit with mixer taps, built in microwave, inglenook with Range cooker, six ring gas hob unit, double oven, tiled recess, limestone floor tiles, two radiators. Superb inglenook with beams over, flagstone hearth and metal canopy over, exposed stone window seats, radiator. A well fitted suite with roll top claw footed bath with chrome mixer taps and shower attachment, low level w.c, pedestal wash hand basin, corner shower with rainfall head and hand shower, walk in airing cupboard with slatted shelving, access to further storage cupboard beyond, two ladder radiators. Adjacent to the neighboring property is a car park area partly brick paved and part concreted, beyond this is a lawned garden sheltered by hedgerow which lead down to a wild garden and a gravelled path leads to the rear of the house. To the rear there are gardens with gravelled surface, brick paved terrace and additional oval terrace. There are well stocked raised beds, pond with fountain and an old stone wall. To the front of the property are private, well stocked laid to lawn gardens. Newton Purcell is a village situated approximately five miles from Buckingham and six miles from Bicester. Amenities within the village include a hall, private dentist surgery and Church. The market towns of Bicester and Buckingham both offer many pubs and restaurants and a more extensive shopping and leisure experience can be had in Milton Keynes, whilst Bicester Village offers outlet shopping. Educational facilities are plenty, including the Royal Latin Grammar Latin School and a number of primary and secondary schools. The well respected public school of Stowe sits slightly further afield amongst its wonderful National Trust landscaped gardens. Newton Purcell has easy road links to the M40 & A34 (Bicester) and the M1 (Northampton). Rail connections are at Bicester North Station providing direct line to London Marylebone (from 50 minutes). From Buckingham take the A421 in the direction of Brackley. At the end f the section of dual carriageway turn left, sign posted to Bicester. The property will be found on the left hand side toward the village boundary. The car park is located on the left adjacent to the next door property No 2 Buckingham Road. Mains water, electricity, LPG and drainage are connected. Council Tax Band D.
Russell and Butler are also able to provide you with independent mortgage advice. For further information please contact 01280 815 999.